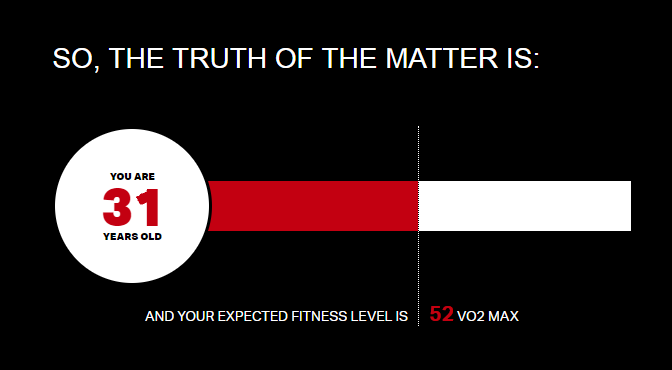 I had a look at 6 different ways of measuring your VO2max. I wanted to see how they all compare, and whether you need to test yourself to failure to get an accurate reading. VO2max is a measure of the maximal volume of oxygen your body can use and it’s a good indicator of cardiovascular fitness. It’s measured in ml/kg/min, millilitres per kilogram of body-weight per minute. 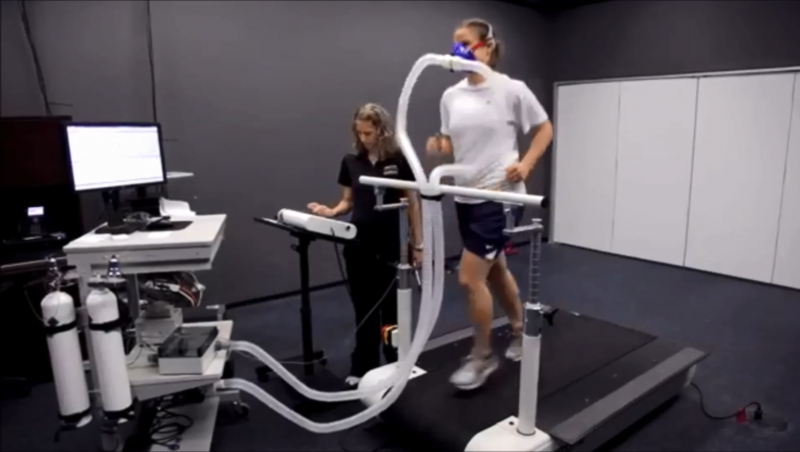 A true VO2max test involves fitting the subject with a mask and making them exercise to failure. This is conducted in a lab and is usually quite expensive. 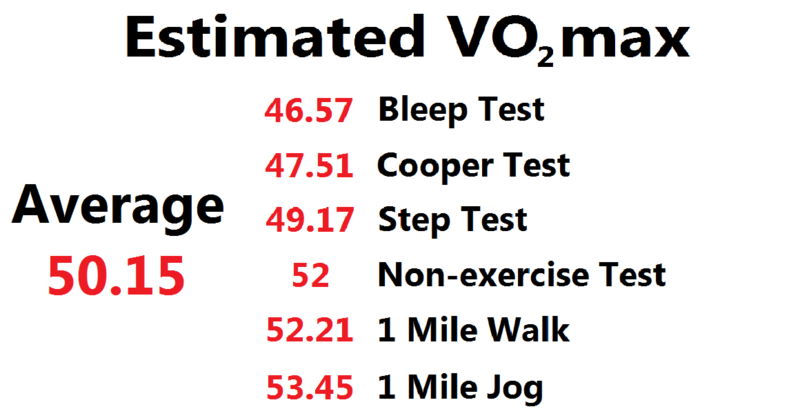 What i’ll be doing is trying out six simple tests that give me an estimate of my VO2max. What is a Good Score on a VO2 max Test? When it comes to VO2 max, “good” is a relative term, and the answer will be based on two things: your gender and your age. Below is a set of normative data for VO2 max for both men and women. What constitutes “average” can vary between research studies due to the population samples they use. Find your age range on the left hand side and read across to see what rating you’d achieve with each score. e.g. If I was a 52 year old male, I would look in the 46-55 range. I can see that scoring around 35 would be average for my age group and a score of 50 would be considered “Excellent”. Elite athletes tend to average 55-65 ml/kg/min with endurance specialists able to reach 75-85 ml/kg/min. Cross Country Skiers are often touted as the athletes who score the highest, with some athletes managing to score 90-95 ml/kg/min on their VO2 max tests. My six tests range from a non-exercise test (online questionnaire) to a maximal run. Each test comes with a margin of error and so by taking multiple tests I can identify a small range that my VO2 max should lie within. 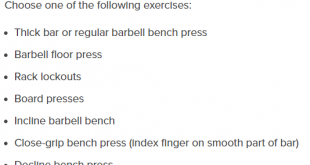 The first test was based on a form I filled out over at World Fitness Level. This is a Norwegian study and it requires basic information like height and weight as well as how often I exercise and at what intensity. To calculate your resting heart rate count your pulse for 15 seconds, then multiply that number by four. I completed the form in a matter of minutes and my estimated VO2 max was 52 ml/kg/min. Also known as the Home Step Test, this requires you to step onto a 41cm box for 3 minutes then measure your heart rate on completion. You will need a metronome like the one found here. For males this has to be set to 96bpm, for females it’s 88bpm. This equates to 24 and 22 complete rounds of an up-up-down-down rhythm on the step. As far as I know you are fine to alternate lead legs as long as the rhythm is maintained. Once 3 minutes are completed, immediately measure your pulse for 15 seconds and enter it here. I counted 35 beats which gives me an estimated VO2 max of 49.17 ml/kg/min. This will be familiar to those who were tested during P.E. lessons at school. Two pairs of cones are set 20 metres apart and an audio is played with a series of beeps. The goal is to cover the 20 metres before the next beep sound, and as the test progresses the beeps get closer together. Level 1 is the equivalent to running at 8 km/hr and after 7 shuttles you move to Level 2 (8.5 km/hr). Each level is 0.5 km/hr faster and there are between 7 and 16 shuttles on each level. You only have to touch your foot between the lines and there’s no need to run beyond it. Once you are no longer fast enough to reach the cones you have completed the test and should remember the level and shuttle prior to the failure. 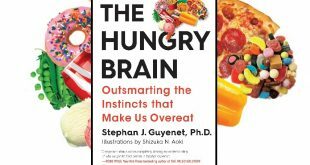 (Sample audio can be found here). I reached the line in time for Level 9 Shuttle 11 before collapsing, and plugging that into the formula here produces an estimated VO2 max of 46.57 ml/kg/min. For this test you are required to walk one mile as fast as possible then measure your heart rate for 15 seconds. You will also enter your gender, weight and age for the final calculation. Since the measurement needs to be precise it’s highly recommended to use an athletics track. 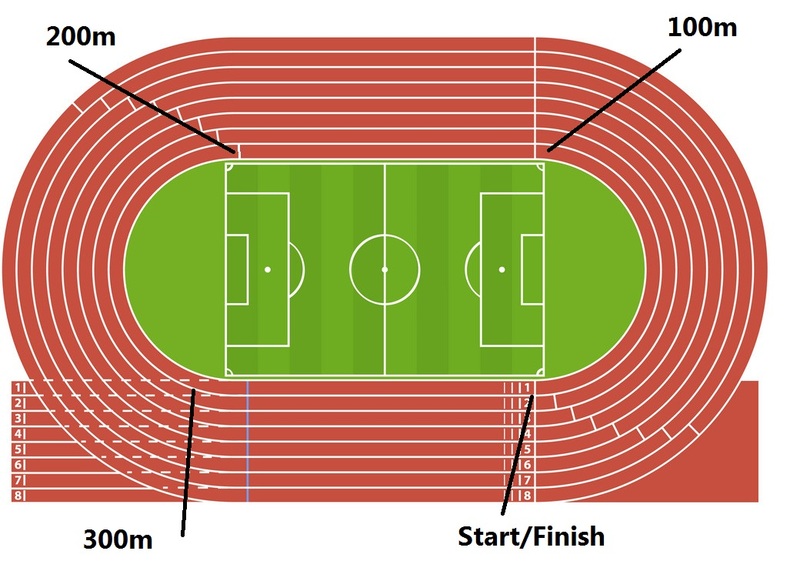 One lap in lane 1 is 400 metres, and one mile is just over four laps (1609 metres). There will be a solid white line to indicate the mile and possibly a marker on the inside of the track. You will need to time how fast you completed the mile (I finished in 12 mins 34 secs) and your pulse immediately after finishing. To convert from your 15 second pulse to beats per minute, multiply the number by four. e.g. 35 beats in 15 seconds, 35 x 4 = 140bpm. Those are entered here and my results gave an estimated VO2 max of 52.21 ml/kg/min. 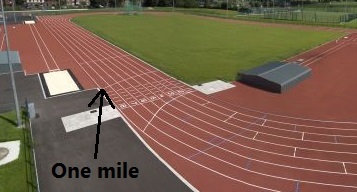 The “mile” line is 9 metres behind the finish line. Four full laps from here in lane one results in 1609m (a mile). The penultimate test is similar to the above, except you will jog the distance. Due to the formula used this is a non-maximal effort and you must finish slower than 8 minutes for males and 9 minutes for females. As before you will record the time it takes to complete the mile and your heart rate for 15 seconds on completion. The formula is found here and requires your gender and weight, with my estimated VO2 max from this test coming out at 53.45 ml/kg/min. The final test may be familiar to endurance athletes and sees the participant run as far as possible in exactly 12 minutes. It’s recommended you start on the FINISH line in lane 1, and stick to the inside lane. The distance should be estimated to the nearest 10 metres if possible. For inexperienced participants it’s often hard to judge the right pace to run this. 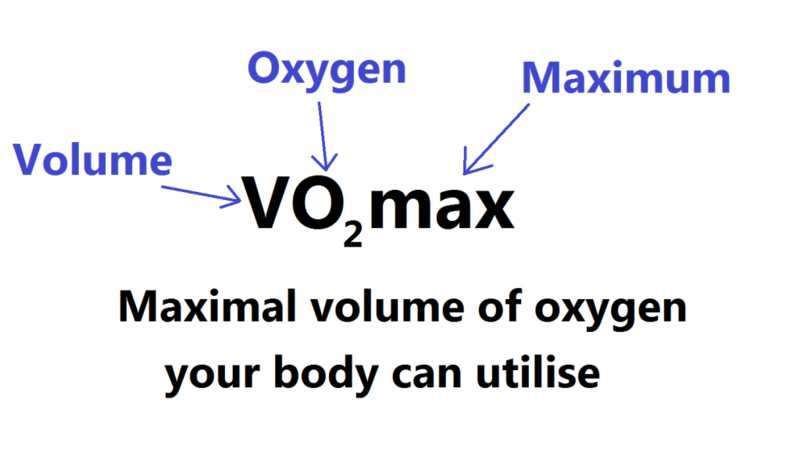 If you have some idea of your VO2 max then you can use the formula here to see what distance you are expected to cover. You can then use that to set your pace (work out a 100m and 400m time to judge while you are running). Prior to the test I knew my score is around 50 ml/kg/min. After trying a few different values I find that 2750 metres produces an estimate of 50.19. 12 minutes = 720 seconds. 26.2 x 4 = 104.8 seconds per 400m lap, or 1 minute 44.8 seconds. If I want to complete 2750m, just shy of 7 full laps, I need to run at a pace of 1:45 per lap. I could also write out the multiples to know what my timer should read for 2, 3, 4 laps etc. 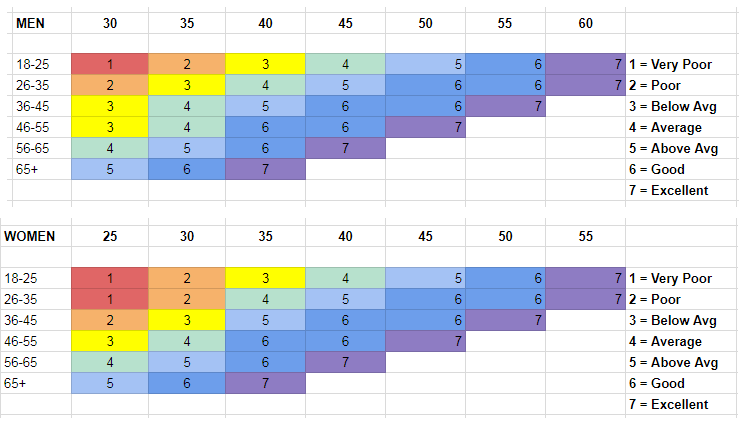 Here’s a few other lap times with their corresponding VO2 max estimates. I didn’t use this method and my first two laps were around 45 ml/kg/min pace, which was too slow. I covered 2630m which input here gives an estimated VO2 max of 47.51 ml/kg/min. When put in order you can see my lowest score was from the Bleep Test and my highest from the One Mile Jog. You might also notice that the two maximal tests, where i’m required to go to failure, produced the lowest scores. There’s the issue with pacing in the Cooper Test but in both cases it could simply be that I wasn’t motivated enough to push to true failure. If you have access to an indoor rowing machine, it’s possible to get an estimated VO2 max from your best 2000m time. I happened to have done this the previous month without knowing it could be used for testing purposes, and achieved a time of 7 minutes 56 seconds at a body-weight of 71kg. Entering those values here produces an estimated VO2 max of 50.14 ml/kg/min. I found this quite entertaining after realising the average from my other six tests was only 0.01 higher than this. If you are not an elite athlete and are interested in determining your VO2 max out of curiosity I recommend taking the Queens College Step Test. At 3 minutes long it was the shortest duration exercise test and could be conducted at home. While the Bleep Test and Cooper Test look more advanced, the need for high levels of motivation will exclude most of the general population from achieving their best scores. If you are currently injured or unable to complete any of the exercise tests then the World Fitness Level survey gave a suitable estimate with very little information.